Crisálida: Community Arts Project | Another trifecta-perfecta in the Eastern Coachella Valley. Another trifecta-perfecta in the Eastern Coachella Valley. 26 Nov Another trifecta-perfecta in the Eastern Coachella Valley. Today was the kind of day that gives me hope — a day filled with art, commitment, promise. 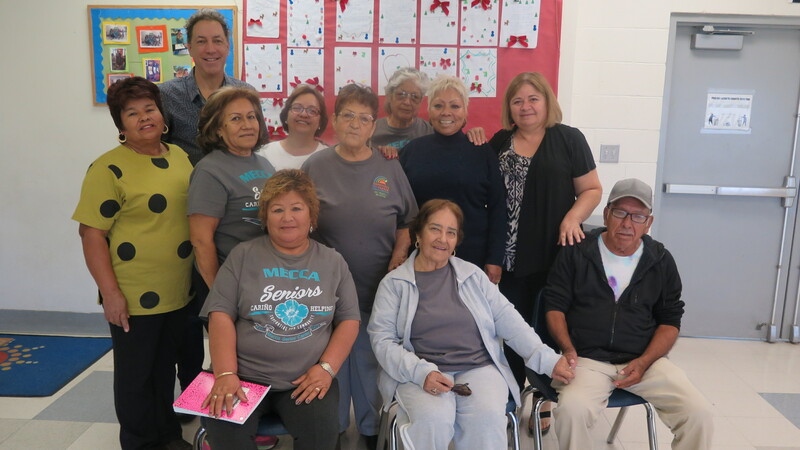 It started with a visit to the Mecca Community Center where I gave a workshop on how to recite poetry out loud to a group of first time writers in Maria Galaviz’ class. Yes, there were tears (of sadness, of pride, of surprise), yes there was laughter at the sheer pleasure of lifting the words off the page and placing them into the ear/heart/mind of the others. And yes, Maria made outrageous pineapple and raisin tamales to boot! Next stop was a lunch meeting with Rodolfo Pinon and Christian Mendez from Pueblo Unido, a grass roots organization that supports the efforts of the many thousands of people in the Eastern Coachella Valley who live in marginal situations in mobile home parks, many without potable water, without roads, without proper sanitation. See their site HERE. We brainstormed a project to gather stories from the “elder storykeepers” at the parks and then to compile these stories into a book. The first interviews are scheduled for next week! I was deeply impressed by the gentle ferocity of these men — they speak low and aim high. It is going to be joy and honor to collaborate with these fine people. 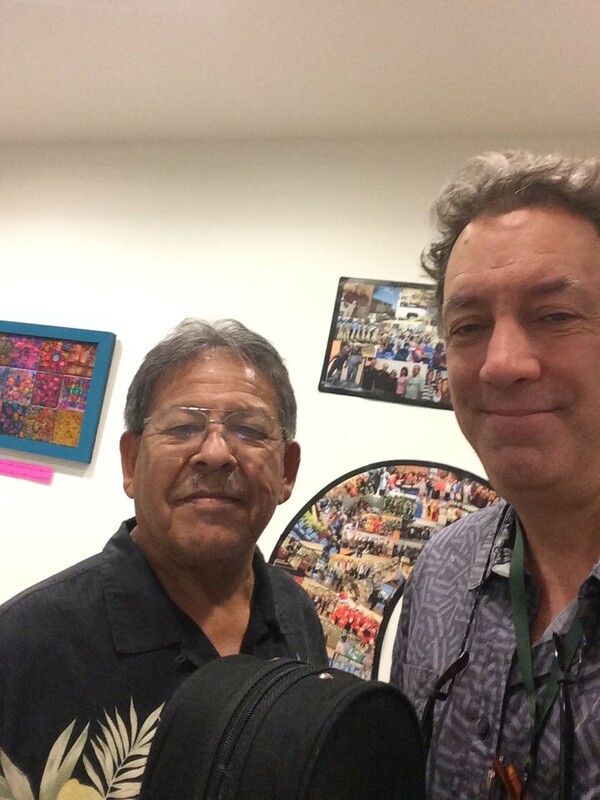 A few weeks ago I met Bernadino Ramirez at the Indio Senior Center. I had just finished a poetry reading and he came up to tell me that he wrote as well, and that he wrote songs. Sing one, I suggested…and BAM! out came a voice that lifted the spirit of everyone left in the room. Turns out Bernadino had quite a few songs so we planned a get-together to listen and to play. Our first session was like the first date with the person you know you will marry — there was chemistry, nuance, details, laughter and clearly a lot more to learn. We went through three of his songs, recorded them, and committed to another writing session. While Bernadino has written gorgeous, poignant, political and romantic songs, and he has composed rich and dynamic melodies for all thirty-five of them, he HAS NEVER PLAYED THEM WITH ANOTHER MUSICIAN! This was the first time he heard his song with accompaniment, and boy did he like it. Well today we had our second session, more songs, but this time other clients of the senior center were curious, the peeked in through the glass door, and a number of them came in to listen, and to participate. 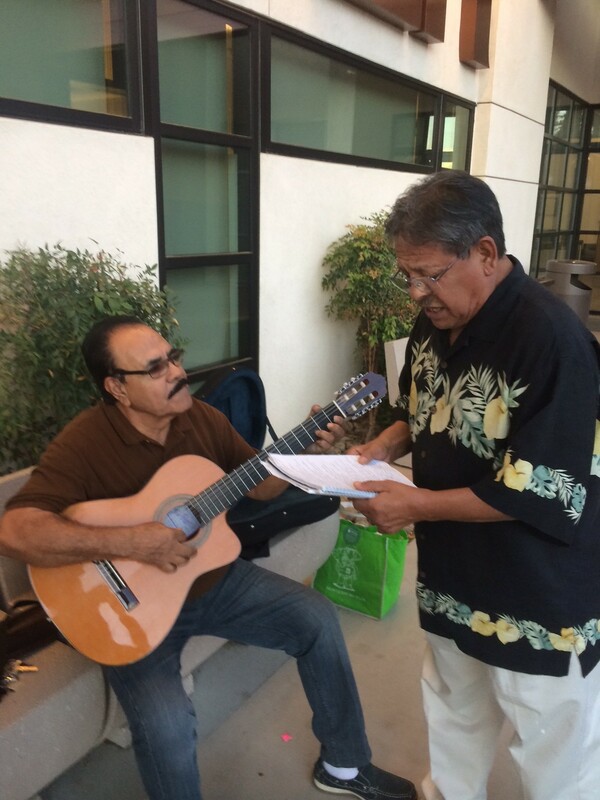 Jesus told me he had written a bunch of songs and then Mr. Estevez joined in to play the guitar (in a much more authentic Mexican Norteno style). The music was still going on when the center closed so we took the jamming outside to the patio where other clients gathered to listen — it was joyful, connected and filled with the baritone sounds of Bernadino’s wise songs. 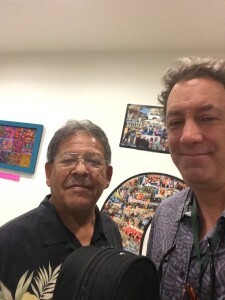 So poetry, storytelling and music…all in one day…all on point with the mission of Crisalida, to serve the Eastern Coachella Valley residents in their efforts to share their creative voices.